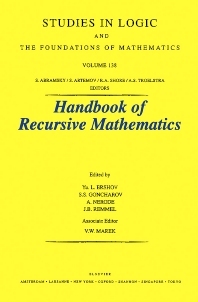 Introduction to the Handbook of Recursive Mathematics (Yu.L. Ershov, S.S. Goncharov, A. Nerode, J.B. Remmel). Pure computable model theory (V.S. Harizanov). Elementary theories and their constructive models (Yu.L. Ershov, S.S. Goncharov). Isomorphic recursive structures (C.J. Ash). Computable classes of contructive models (V.P. Dobritsa). &Sgr;-Definability of algebraic structures (Yu.L. Ershov). Autostable models and algorithmic dimensions (S.S. Goncharov). Degrees of models (J.F. Knight). Groups of computable automorphisms (A.S. Morozov). Constructive models of finitely axiomatizable theories (M.G. Peretyat'kin). Complexity theoretic model theory and algebra (D. Cenzer, J.B. Remmel). A bibliography of recursive algebra and recursive model theory (I. Kalantari). A bibliography of recursive analysis and recursive topology (V. Brattka, I. Kalantari).